"I want to make my country safe for my people," says Cambodian Aki Ra. It’s a nice sentiment but when the story behind those words is known, it takes on a whole new meaning. Cambodia is littered with landmines. It is estimated that between six million and 11 million mines are still active and in the ground. Furthermore, countless unexploded ordnance (UXO) including bombs, mortars, grenades and bullets remains. 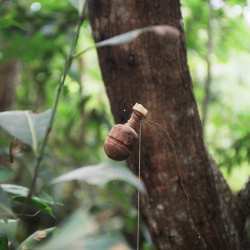 Much of it was originally connected to trip wires and rigged as booby traps. 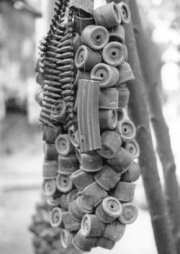 It is estimated that 800 people are killed or wounded as a result of this ordnance in Cambodia every year. Put another way, two or three people will step on a landmine or walk through a trip wire, every single day. A living example of the continual plight affecting Cambodia is Sopphart, a man I met on my recent trip to Cambodia. Sopphart comes from Poipet, in Cambodia’s north. One day, while collecting firewood with his older brothers, Sopphart stepped on a mine that blew off his foot. Hearing the explosion, his brothers, who were a short distance away, ran towards him to help. As they did, one of them ran through a tripwire connected to a fragmentation grenade. That grenade killed his brothers instantly and a fragment from the grenade blinded Sopphart in one eye. Within seconds, Sopphart had lost his foot, his eye and his two brothers. Like all Cambodians alive at the time, Aki Ra became part of Pol Pot’s extreme communist experiment that tried to turn Cambodia into a worker’s paradise. When the Khmer Rouge seized power on 17 April 1975, the cities and towns were evacuated and all residents, including Aki Ra and his family, were moved into labour camps. 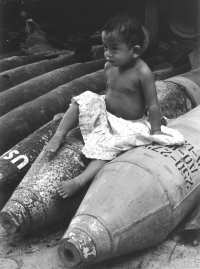 The Vietnamese entered Cambodia in 1979 and rapidly overthrew the Khmer Rouge. Strong resistance was encountered in some areas, however, and it wasn’t until 1983 that Aki Ra was captured. Like the Khmer Rouge, the Vietnamese were desperate for soldiers and Aki Ra was subsequently conscripted by the Vietnamese to fight the remaining Khmer Rouge factions. In 1989, the Vietnamese withdrew from Cambodia, leaving the "cleanup operation" to the restored Cambodian Army. Aki Ra entered his third fighting force. Fortunately, Aki Ra was linked to United Nations Peacekeepers who had come in to begin de-mining operations. “I worked with the UN for three years until they left Cambodia. I decided that the best step for me was to carry on working to clear the mines. However, I did not have the use of the specialist equipment and had to make do with more simple tools which I have mastered,” Aki Ra said. Now in his mid thirties, Aki Ra has dedicated his life to the removal of mines and UXO throughout Cambodia. Having collected bits and pieces over the years and with easy access to all manner of weaponry and war relics, Aki Ra turned his growing collection into a museum hoping to educate tourists and locals alike about the horrors of landmines and UXO. As a side issue, Aki Ra and his wife Hourt act as guardians to many landmine victims, who stay with them at their home and museum in Siem Reap. Incidentally, one of those children is Sopphart. A fund was established in early 2006 to ensure the children in Aki Ra and Hourt’s care will have a chance at a university education if they choose. 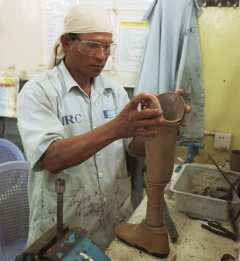 The fund has been so successful that a second phase has begun to benefit other landmine victims. Aki Ra’s work is becoming well known throughout Cambodia. When landmines or UXO are found, villagers send word to him and Aki Ra simply travels to the village, goes to where the mine was detonated and finds and disarms all the others. Having spent so much of his early life laying landmines, and with his UN experience, Aki Ra knows instinctively the patterns they were laid in, and thus where to look. On a good day, Aki Ra will find 100 to 200 mines. The sheer volume of landmines in Cambodia, and the devastation they have brought Cambodia, is mind-boggling. Aki Ra’s dedication to the removal of every mine and unexploded ordnance is in a realm beyond admirable. Through sheer determination he hopes to make his country safe for its people. While he cannot possibly hope to do it alone, it is people such as Aki Ra who give cause to hope that one day Cambodia will be able to put the reign of Khmer Rouge behind it, and look to a brighter future. Post Script: In early 2005 Aki Ra accidentally inhaled dynamite, bringing him close to death and leaving him with severe health problems. It has done little to slow him down but rather strengthened his resolve to make his country safe. More can be found out about Aki Ra at his website: www.akiramineaction.com. Recent articles by Matthew Smeal. I wonder how successful Aki Ra might be, but I wish him every success in his quest. Cambodia is a country that has suffered enough.